the best vision solutions for your needs. and serving all of your vision care needs. (905) 951-3081 or send us a message. Let our Doctors at Bolton Vision Centre assess your eyes, determine if they are healthy, and correctly determine your sight needs. All eye emergencies will be seen promptly at our office. At Bolton Vision Centre we feel that quality eye care is the result of an ongoing partnership between the doctor and the patient. We will take the time to listen to your eye care concerns, explain the results of your eye exam, and help you determine the best vision solutions for your needs. It is through your eyes that you perceive the world around you. People often take their eyesight for granted, but it is one of the most valuable senses we have. Your eyesight, however, can deteriorate over time. This may be due to regular aging changes such as presbyopia and cataracts or medical conditions such as diabetes, high blood pressure, and glaucoma. In order to maintain your best eyesight it is important to have your eyes checked regularly by a licensed optometrist. Our office provides eye examinations, glasses, sunglasses, contact lenses and laser vision surgery co-management. Let Bolton Vision Centre take care of all your eye care needs. We believe that there is more to your eye exam than just checking your eye ware prescription. We want to be an integral part of your healthcare. Allow us to examine your eyes, eye ware if they are healthy, and correctly determine your sight needs. 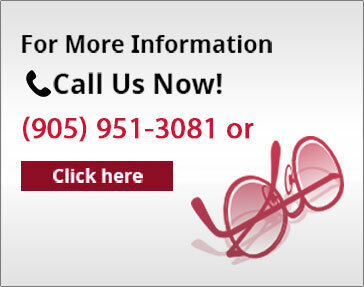 Bolton Vision Centre is an optometry clinic that has been providing quality eye care to Caledon for over 20 years. We provide comprehensive eye care to patients of all ages. All of our Doctors are TPA certified allowing us to diagnose and treat a wide range of conditions such as red eyes, dry eyes, eye injuries, glaucoma and macular degeneration. We employ the latest technologies to assess the health of your eyes such as Digital Retinal Imaging and Humphrey Visual Field testing. Our Doctors also provide pre-operative and post-operative care if you are interested in having eye laser surgery done. We are able to let you know if you are a candidate for laser surgery, and if you are what type of laser surgery is best for you. All of our eye doctors and staff are trained in the latest developments in eye care to make sure you are receiving the best and most current testing and treatments available. When you come to see an eye doctor from Bolton Vision Centre, you can be assured we will be seeing to all your vision needs. Not only do we want to make sure that your eyes are healthy and that you are seeing your best, we want you to find a pair of eyeglasses that you will love to wear. Your eyeglasses should be a reflection of who you are and how you want others to see you. We have a large selection of designer and value eye-wear. Our experienced staff will be happy to help you find a pair of glasses that are right for you. In order to have the best vision, the lenses that you put in your frames are very important. Our knowledgeable doctors and staff will help guide you to the proper lens that will give you the best vision with your new eye-ware. For your convenience, our optometry clinic has an on-site lab and we are able to provide one hour to next day service on many prescription eyeglasses. Wearing a properly fit and maintained pair of contact lenses is essential for your best vision and eye health. The eye doctors at our clinic fit many different types of contact lenses. We offer soft, colored, rigid gas permeable, and specialty lenses such as bifocal or astigmatism correcting contact lenses. A comprehensive eye exam involves a number of procedures to determine your eye health and vision. These procedures vary from simple testing such as reading the eye chart to more complex procedures such as using bio microscopy to determine your eye health. Eye care experts from our family optical clinic recommend that adults have a complete eye exam every 1-2 years depending on their health and vision concerns. Children should have their first eye exam by age 6 months and then yearly from age three on to ensure proper eye sight while in school. If you do not require an eye exam and already have a valid prescription, feel free to come in to our family optical and pick out a pair of glasses or sunglasses. We also carry a large selection non-prescription sunglasses and we stock supplies of many popular brands of contact lenses at our eye clinic. Our office is open Monday through Friday and we offer evening and early morning appointments for your convenience. All eye emergencies will be seen promptly at our office. Please call us at (905) 951-3081 or book an appointment through our web-site. We are your premium eye clinic and have been proudly servicing clients from Bolton, Caledon, Caledon East, Nobleton, Palgrave, Kleinburg, Orangeville, Brampton, Vaughan and surrounding areas, since 1994. Get in touch with us by visiting our contact page and filling out the form or call us at (905) 951-3081.